When you think of typical primary battery cells (non-rechargeable by definition), something like the standard Ray-O-Vac carbon (actually zinc-carbon) model probably comes to mind. The reason primary cells cannot be recharged is that the cathodes are consumed in the reaction with the electrolyte during current flow. Secondary cells are rechargeable because the current-producing reaction does not consume the cathode (at least not as rapidly), so applying a reverse voltage drives the electrons back from whence they came allowing the discharge process to happen again. There is another type of primary cell - the fuel cell - that never really discharges but is constantly fed with a chemical (or combination of chemicals) that facilitates a reaction between electrodes and the electrolyte. Therefore it never needs to be recharged in the traditional sense - just refueled. In a sense a fuel cell is more of an electric generator than a battery. Turn off the external energy source (coal, hydro, nuclear, wind, sunlight) to a generator and the current flow stops. 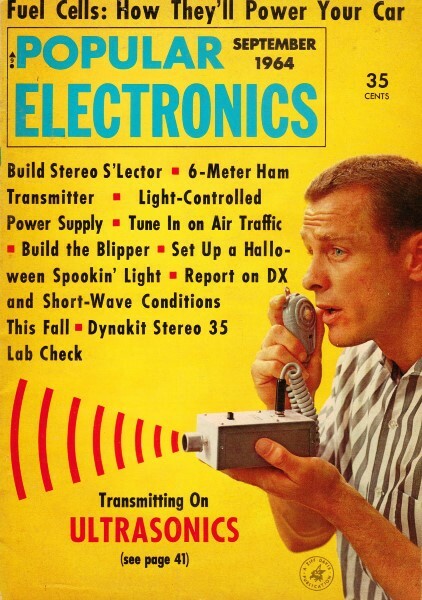 This report from a 1964 edition of Popular Electronics describes some of the early work on fuel cells. Even as you read this, the first fuel cells are on their way into space. Tomorrow? Fuel cell-powered cars are just one possibility. One day in the not-too-distant future you may be able to drive into a gas station, pull alongside a pump labeled "methane," and order a tankful for your car. You won't be driving some new breed of jet or turbo-powered chariot, but a car with a power plant that is as old as the automotive industry itself - an electric motor. The unusual feature of this car will be the part that provides the electricity, a new kind of generating device that gulps a variety of inexpensive gases and produces power. The device is called a fuel cell, and while it is still experimental, companies working on its development have already reported progress that seems almost unbelievable. This generalized drawing shows basics of fuel cell operation. The electrolyte may be liquid, semiliquid, or solid; the electrodes can be carbon, plastic, platinum or nickel boride, typically in combination. Fuel depends largely on the type of electrode used; hydrogen reacts very easily, but inexpensive hydrocarbons are now being used thanks to improvements in cell electrodes. New electrode materials are constantly being evaluated in the search for reliable, economical fuel cells. At left, a G.E. 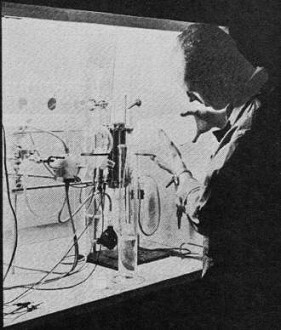 researcher tests electrode material with electrolytes of varying acidity and alkalinity. The fuel cell is a kissing cousin of the more conventional electrochemical batteries that we use every day. Like batteries, it works through a chemical reaction that produces a lot of free electrons. But unlike batteries, it can be "refueled" by replacing chemicals that have been consumed in the reaction, and it will continue to function at normal operating levels all the while. And what operating levels they are! Fuel cell modules have already been constructed with continuous outputs of 2.5 kilowatts. When discussing characteristics and life tests, it is customary to refer to a cell in terms of amperes-per-square-foot (of electrode surface), and these figures are normally several hundreds of amperes for a typical fuel cell configuration. To understand just what all the noise is about, let's take a quick look at conventional batteries and the way they produce electricity. Dry cells, whether of the zinc-carbon type used in flashlights or the more sophisticated alkaline variety, all produce electric current by means of the chemical reaction that goes on between certain key materials - the electrodes and the electrolyte. The electrolyte is a liquid or semiliquid that reacts chemically with the negative electrode, usually zinc, producing many free electrons. The electron stream returns through the load to the positive electrode and moves through the electrolyte to the negative electrode where the electrons are again freed by the chemical action. This chemical action consumes both the negative electrode and the electrolyte. In dry cells, the result is a dropping off of the cell's productivity; eventually the cell must be discarded. In wet-cell batteries such as the automotive type, if the consumption of negative electrode and electrolyte has not progressed too far, the chemical action can be reversed by applying a direct current to the battery terminals to recharge it. The ability to be recharged draws a distinct line between two battery types. Primary batteries cannot be recharged; secondary batteries can. Although there are many similarities between a fuel cell and a primary battery, the big difference is that the electrodes and electrolyte used in the fuel cell are not changed or consumed during the operating life of the device. The 12" x 14" fuel cell module uses economical carbon electrodes combined with a minimum of precious metal catalyst. Made by Union Carbide, it is a hydrogen-oxygen low-temperature unit. The zinc (or magnesium or lead) electrode used at the anode in a primary battery cell actually serves two purposes - that of an electrode and that of a "fuel" which is consumed as the cell wears out. The electrodes used in a fuel cell are not used as fuel. The fuel-hydrogen, hydrocarbons, etc. - is continuously fed to the cell from an external source. 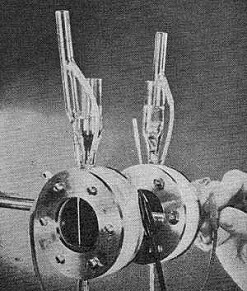 A hydrogen-oxygen fuel cell, circa 1959, shows immense progress that has been made in a few years. Object at right of G.E. cell is a motor with a propeller. A recent development is a cell that uses inexpensive hydrocarbon fuels and oxygen. Devised by Dr. Thomas Grubb and Dr. Leonard Niedrach of G.E., the cells shown below operate on such fuels as diesel oil, gasoline, and propane gas. As shown in the generalized drawing of a fuel cell (p. 48), the chemical reactions that produce a flow of electrons in the external circuit take place in the cell's porous catalytic electrodes. This terminology largely explains the function of the electrodes: they absorb fuel and oxidant by virtue of being porous, and promote a reaction between the two which generates electricity. 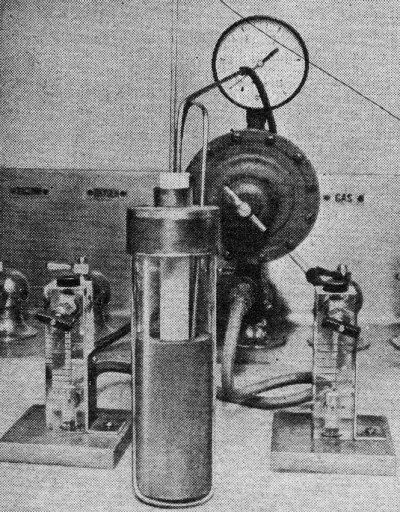 Producing the perfect electrode for fuel cells is one of the big problems that has stumped researchers ever since a brilliant scientist, W. R. Grove, conducted experiments with elementary fuel cells back in 1839. Carbon and polymer plastics have been used for electrodes. More recently, spongy platinum and nickel boride have come along. Without laboring the point, producing economical electrodes that can promote and contain fuel cell reactions without themselves changing is no mean trick. 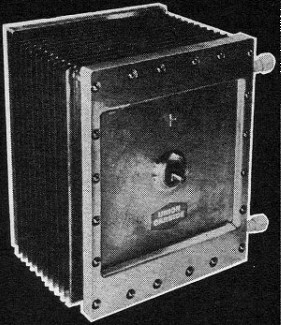 This experimental high-temperature fuel cell uses a solid zirconia electrolyte (white cylinder). The dark cylinder is a graphite electrode. Cell uses natural gas and oxygen to generate electricity. 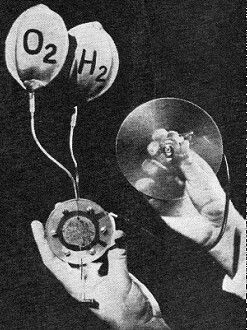 In operation, the two electrodes of a hydrogen-oxygen fuel cell absorb their gases by diffusion, the anode taking on oxygen and the cathode hydrogen. The two electrodes are separated by a liquid or solid electrolyte, and the reaction takes place at the surface where the electrolyte makes contact with the electrodes. A cutaway mockup of one of the fuel cell canisters installed in Gemini. Fuel cell modules - the first may be in orbit when you read this - produce drinking water for astronauts as well as up to two kilowatts of electrical power. When the oxidant (air or oxygen) reaches the cathode of the fuel cell, it is absorbed by the cathode and enters the electrolyte in a process called "sorption." The exact mechanism by which sorption (a general term meaning the same as "absorption" but used when the phenomenon is unknown or indefinite) of the oxygen takes place remains one of the mysteries of fuel cell operation. On reaching the anode, the oxygen combines with the fuel absorbed by the anode and oxidizes it, producing electricity in the process. This fuel-cell-driven golf cart made by Allis-Chalmers shows the feasibility of putting fuel cells to work powering vehicles. 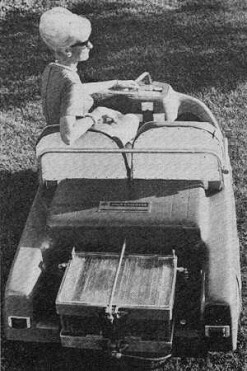 A fuel-cell-operated farm tractor was demonstrated by firm as early as 1959. Amazing as it may seem, no heat is produced other than a small amount due to electrochemical inefficiencies. The fuel cell thus becomes the world's most perfect generator of electricity. With no. moving parts and no energy-wasting boiler-turbine combinations which convert fuel by burning it, the fuel cell strips electrons from the fuel and sends them into an external circuit to do useful work! 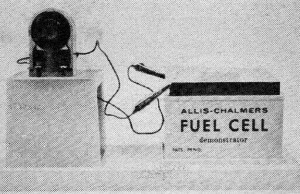 A classroom demonstrator of fuel cell principles, this working model created by Allis-Chalmers uses either alcohol or sodium or potassium hydroxide as fuel, and hydrogen peroxide as an oxidant. Platinum, silver, and nickel electrode plates are positioned in tank at right, and the two end plates connected to the miniature electric motor furnished with the model. Priced at $9.75, model is available from Science Materials Center. Inc., 220 East 23 St., New York, N.Y. 10010, less necessary fuels. Referring back to the fuel cell drawing, the stripped atoms of fuel, now positive ions, migrate back through the electrolyte to the cathode where they combine with the oxidant to produce water, a "waste" product which, incidentally, may prove very useful. Depending on the fuel used a waste product is also produced on the anode side of the fuel cell; in the case of hydrocarbons, this is carbon dioxide as in a gasoline engine. Unlike a gasoline engine, however, which may have at most a conversion efficiency of 30 to 40 percent, the fuel cell has efficiencies of 50 to 60 percent at present, and theoretical levels up to 98 percent. Another big fuel cell advantage is that air can be used as the oxidizing gas. This completely eliminates the need for a separate oxygen supply for cells operating anywhere on the earth's surface. Of course, cells lofted into outer space must carry their oxygen. The one disadvantage of using air is the lower productivity that results. When a cell is pressurized, the available yield in amperes per square foot of electrode goes up. As the device operates, its temperature also goes up (due to the inefficiencies mentioned earlier) which further raises the yield. While fuel cells using inexpensive hydrocarbon fuel (i.e., anything from natural gas to gasoline to diesel fuel) hold the most promise for future down-to-earth commercial applications there is still a great deal of developmental work ahead. One of the major obstacles is the high cost of the platinum alloy electrode material which seems to hold the key to making these inexpensive fuels react to produce electricity in a fuel cell. Raising the operating temperature raises the cell's output, but with one bad side effect - it causes corrosive action at the electrodes, a condition that can ruin the cell after a relatively short time. But the advantages of elevated temperatures can be retained by the use of a solid electrolyte designed to withstand them. One such material in use is lime-stabilized zirconia. In a cell of this type, a fuel such as methane (natural gas) is fed to one side of the cell where it forms carbon on the electrolyte surface. The carbon becomes both the anode and the fuel. The operating temperature of this cell is normally about 1800° F (about 985° C). This temperature is above the melting point of silver and it is molten silver which forms the base for the negative electrode. Oxygen is diffused into the silver, and the high operating temperature is maintained simply by burning off gases within the cell. High-temperature cells in this category have produced current densities up to 150 amperes per square foot of electrode area. Nominal voltage for such a cell is 0.7 volt, making the single-cell power output a little over 100 watts per square foot of electrode. A further development that is still being evaluated is known as the "Redox" (reduction and oxidation) cell. 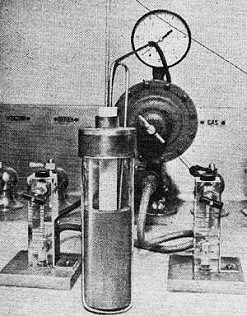 This device involves a two-step process in which an intermediate gas-liquid reaction occurs in the electrolyte itself. The Redox cell, although it isn't as efficient as the more conventional types, has lower internal resistance losses which more than offset the lower efficiency level. It is still largely experimental, however. Fuel Cells in Outer Space. The state of the art has advanced sufficiently in certain cell types to make it possible to use fuel cells in space vehicles. Several experimental devices have been lofted into outer space as part of a testing and evaluation program. The units tested have shown virtually no effects from prolonged periods of weightlessness and high-gravity acceleration and deceleration. Cells recovered from space probes have continued to function normally in laboratory life tests, still operating at optimum efficiency. In fact, the space testing has been so successful that G.E. is now building fuel-cell modules for use in the Gemini space program at the rate of one complete system every two weeks. The first systems have been delivered, and one is scheduled for launching later this year - perhaps even as you read this - as part of the equipment of the unmanned Gemini Number Two space vehicle. 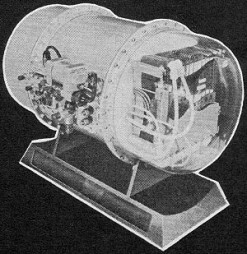 The Gemini system is made up of twin canisters two feet long and a foot in diameter, each containing 100 individual solid-electrolyte (the electrolyte portion of each cell is known as an "ion-exchange membrane") fuel cells. The system is highly reliable, has a high power output (up to two kw. ); and is much lighter in weight (145 pounds not counting fuel) than any other comparable power source. By way of comparison, a typical fuel cell system designed to provide outputs of 500 watts to two kilowatts for 10,000 hours reliability weighs (including fuel) between 400 and 500 pounds. Solar cells and battery systems with comparable outputs and reliability would weigh in the neighborhood of 700 pounds. And solar cells have a further disadvantage. Because they must be mounted externally on the space vehicle, they are especially susceptible to damage by radiation and minor meteor collisions. The twin cylinders installed in Gemini Two each contain three fuel-cell stacks which can be operated separately depending on power supply requirements. The fuels are stored at temperatures near absolute zero, and waste heat generated within the cell is carried off by a circulating cooling system. Another aspect of the fuel cell is its by-product: potable water. In Gemini, the water will be made available for consumption by the astronauts who man future vehicles, thereby reducing the payload. Compared with conventional power sources in size, weight, and maintenance required, the fuel cell offers some enormous advantages. In a typical military field application, such as providing power for a front-line communications outpost, the fuel cell is expected to surpass such power sources as primary batteries, secondary batteries including nicads and wet-cell storage types, and the frequently used gasoline-driven motor-generator. The primary batteries have to be replaced frequently, especially if they must deliver sustained current outputs for radio transmission. Secondary batteries must be recharged. This means using a noisy (and therefore frequently undesirable) motor generator set or replacing the batteries at regular intervals with recharged units brought up from the rear. The motor generator itself may be too cumbersome to bring up to some positions, its noise of operation can attract the enemy's attention, and it must be constantly pampered, fueled and maintained. The fuel cell is completely quiet in operation. It can deliver sustained high current for indefinite periods of time, and it is fueled with easily transported gases or liquids. In fact, the total weight of a fuel cell system along with enough fuel to run it for several weeks may be less than the weight of a comparable set of storage batteries that require constant recharging. And powerful they are. On the basis of present-day technology, fuel cells will soon be able to deliver about a kilowatt for every 15 to 20 pounds of weight! Yet another advantage of fuel cells as compared to gasoline engines, for example, is that fuel cell efficiency increases with partial loads, and under no-load conditions, no fuel is consumed at all. This no-load no-consumption feature separates the fuel cell from both engines and conventional electro-chemical batteries. Any engine uses fuel when it is idling. Earthbound applications for fuel cells in the near future include providing power for electric switching locomotives; experts believe that such an all-electric system will be far more efficient and easier to control than the conventional diesel-electrics in common use today. Powering midget submarines is another potential application, although the subs will have to carry a canned oxygen supply for extended periods of deep under-surface travel; a snorkel will provide air for shallow operation. One of the most intriguing possible uses is in the electric automobile. Several years ago, a major manufacturer of solar cells exhumed a museum-piece electric car and covered its roof with solar cells as a publicity stunt. The car ran beautifully as long as the sun was shining. What was possible with primitive turn-of-the-century batteries and today's solar cells will certainly be feasible with fuel cells. If the car's cells use methane, the car can be refueled simply by having the local power company run a pipe for natural gas into the garage. Refueling on the road will be done the same way, via natural gas outlets in filling stations. And it'll be a lot cheaper than gasoline. There will be far less maintenance required, too, since an electric motor has just one moving part. As a portable source of direct energy conversion, the fuel cell appears to hold almost unlimited promise. Its ruggedness and reliability have already been proven in the rigorous environments of outer space and re-entry, and continuing tests indicate an almost incredible life­span for this electrochemical generating device.